shower, hand held eye/face wash. Durable one-piece seamless fiberglass construction with glass smooth white surfaces and coved corners for ease of clean-up. Stainless steel Grab bars located on right & left sides to support victim and rescue personnel during decontamination, included. Plumbing is provided, for installation by local certified plumber. Plumbed to single point 1-1/4” IPT. connection. Tempered warm water supply connection 20 GPM water supply is required. 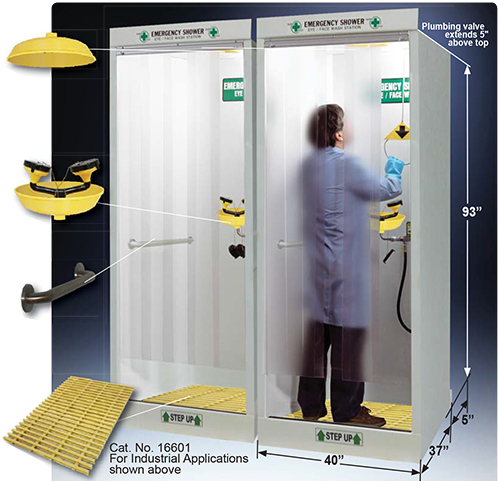 Laboratory Applications Emergency Drench Shower Booth, same specs as above except with finished exterior side panels. Mounted on the front side-wall of the fume hood. Includes 8’ hose and surface escutcheon. 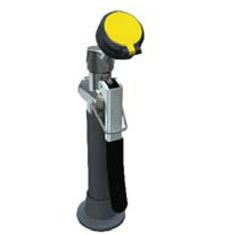 Constructed of 3/4" Polypro for durability, sanitation & corrosion resistance. Equipped with a pull rod activated shower and push handle eye / face wash for quick rinsing of eyes, face and body. • All in only 5 or 6 sq. ft. of floor space! 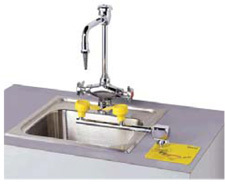 • Constructed of 3/8” Polypro for durability, sanitation & corrosion resistance. • Shipped completely assembled, ready to install. • All plumbing is ready to connect. 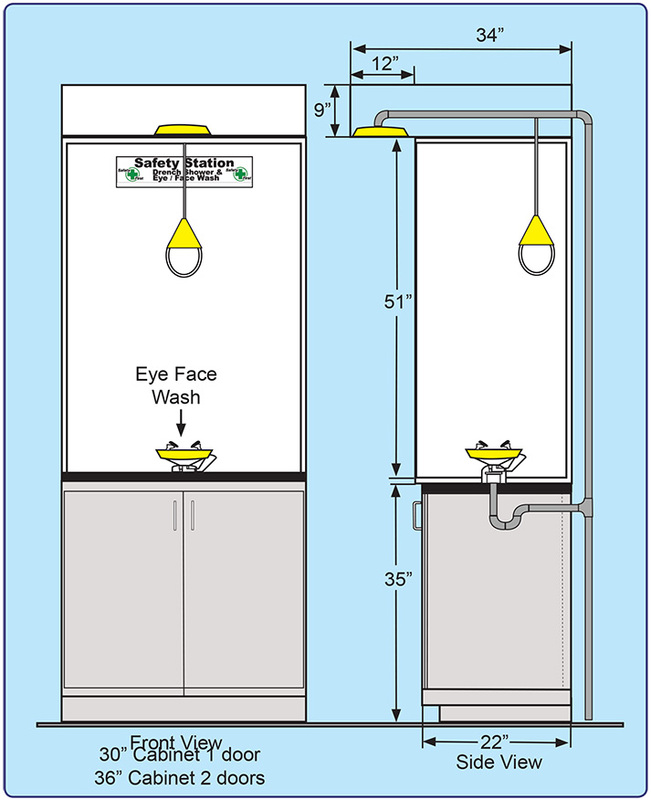 • Fixtures meet ANSI Z358.1 standard for Safety Showers. 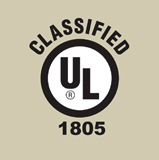 • Ideal for areas where persons may be exposed to potentially hazardous chemicals. 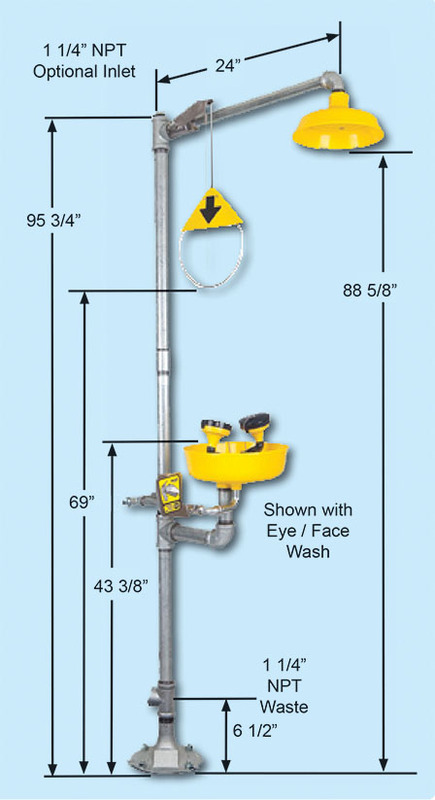 • The HEMCO Safety Station is equipped with a pull rod activated shower and push handle eye/face wash for quick rinsing of eyes, face and body. • Towels and first aid supplies can be stored in the cabinet below. • Supply 1.5” NPT, Drain 1.25” NPT. 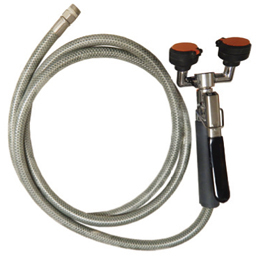 Hand held body wash - squeeze valve nozzle on 8’ coiled hose and bracket. Can be used to rinse all body parts while victim is sitting or lying down. Wall or hood mounted, 3/8 NPT, barrier free. when pivoted. 1/2” NPT. Barrier free. The Drench Shower provides a continuous stream of non-injurious water for 15 minutes or longer, after activation. •Shower head delivers a minimum of 20” diameter pattern to the target area 60”above standing level. •Eye/Face wash heads with float off covers manufactured of UV resistant ABS plastic mounted in a high visibility ABS bowl. @ 30/70 psi of flowing pressure from the eye/face wash.
• PIPING: Schedule 80 hot dip galvanized steel. • EYE/FACE WASH HEAD: ABS plastic dual stream heads with ABS plastic float off covers secured with stainless steel bead chains. • VALVES: Chrome plated bronze stay open ball valves with chrome plated balls, stainless steel valve stems, stainless steel push plate with actuation graphic (eye/face wash) and stainless steel pull rod assembly with actuation graphic (shower). Valve size 1”, eye face wash 1/2” strainer Tee option: 1/2” BCP, 16 mesh. Faucet mounted eyewash is constructed of stainless steel. Provides ease of installation on standard faucets. Inverted water flow pattern provides superior eye protection. The Faucet mounted eyewash is a faucet mounted eyewash that provides business facilities with eye wash irrigation capabilities in an attractive, low cost package. • Installation is easy, with a variety of industry standard adapters included that allow the eye pod to be used with standard faucets. • Features a built-in thermostatic safety valve that will automatically shut off eyewash flows at 100 degree Fahrenheit, diverting all water out through the aerator at the bottom of the unit. This protects users from accidentally irrigating with water that is too hot. When the water temperature returns to a safe temperature, eyewash flow is automatically restored. • Traditional eye washes irrigate from the outside edge of the eye back toward the nose. where contaminants can then be flushed into the nasal cavity through the lacrimal punctum, natures ocular cavity drain.